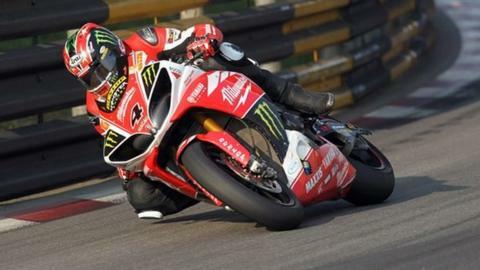 Eight-time Isle of Man TT winner Ian Hutchinson has signed for the Penrith-based Paul Bird Motorsport team for the 2015 road racing campaign. The deal will see the Yorkshire racer compete in the team's colours for the remainder of this year and the full 2015 season. The 35-year-old said he was "mega happy" with the deal. Hutchinson has undergone about 30 operations in the last four years following a crash at Silverstone. The deal will see him have a concerted factory-backed effort at the 2015 Isle of Man TT races, North West 200 and Ulster Grand Prix. Hutchinson said: "I was disappointed that this year didn't work out as I had hoped, especially with having such high expectations, but now I know I've got a real chance of success. "The team is proven and hopefully I can get back to winning ways very soon." He will have full Supersport, Superstock and Superbike machinery for all the major international road races. Team owner Paul Bird said: "He's a quality rider and you don't win five TTs in a week by chance." Hutchinson will also contest the final two rounds of the Pirelli National Superstock 1000 Championship and is aiming to retain his Macau Grand Prix title.